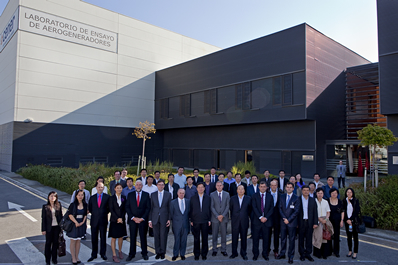 A delegation of 40 representatives of China’s leading energy institutions and companies visited CENER’s Wind Turbine Test Lab this morning in Sangüesa. The delegation included senior figures from China’s energy sector, such as Liu Qi, Deputy Minister and Director of the Chinese National Energy Administration (NEA), and Wang Zhongying, Assistant Director General of the Energy Research Institute (ERI). During their visit to CENER, they met with the Managing Director of the Centre, José Javier Armendáriz, who talked to them about its major technology development projects and also showed them the test facilities of the most complete and complex wind energy component testing lab in the world at this present time. As a result of contacts made previously with technicians from China, CENER was invited by the Danish national research centre Riso to take part this year in a viability study conducted by the China National Renewable Energy Centre, CNREC. CNREC will report to the National Energy Administration (NEA) and its main task will be to develop the relevant legislation and regulations, as well as to coordinate technological research that favours the implementation of renewable energy in China. At the start of September, CNREC held the first meeting of its Advisory Board, with the participation of CENER as an international expert. Furthermore, there are also plans for CENER to carry out projects related with technology transfer, and the testing and certification of components, on the basis of an agreement to be signed by the Spanish Ministry of Industry, Tourism and Commerce, and its opposite number in China. 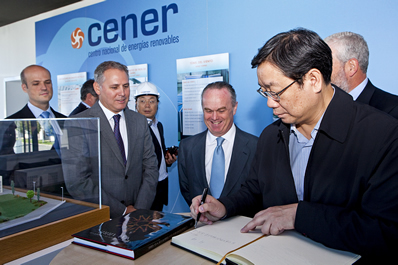 As well as acknowledging the hard work and efforts of CENER, the members of the Chinese delegation praised the decentralised nature of renewable energy policy in Spain, and the notable socioeconomic success of Navarre as a region, which they see as an example to be followed and implemented in their own country.